The number of hungry Ethiopians needing food aid has risen sharply due to poor rains and the El Nino weather phenomenon with around 7.5 million people now in need, aid officials said Friday. That number has nearly doubled since August, when the United Nations said 4.5 million were in need -- with the UN now warning that without action some "15 million people will require food assistance" next year, more than inside war-torn Syria. "Without a robust response supported by the international community, there is a high probability of a significant food insecurity and nutrition disaster," the UN Office for the Coordination of Humanitarian Affairs, OCHA, said in a report. The UN children's agency, Unicef, warns over 300,000 children are severely malnourished. The Famine Early Warning Systems Network (FEWS NET), which makes detailed technical assessments of hunger, predicted a harvest "well below average" in its latest report. "Unusual livestock deaths continue to be reported," FEWS NET said. "With smaller herds, few sellable livestock, and almost no income other than charcoal and firewood sales, households are unable to afford adequate quantities of food." 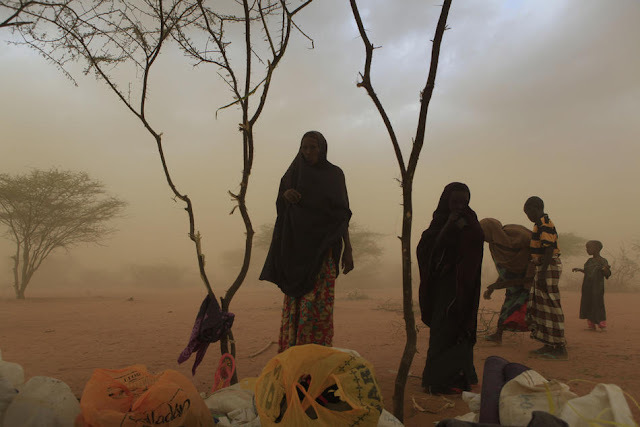 Ethiopia, Africa's second most populous nation, borders the Horn of Africa nation of Somalia, where some 855,000 people face need "life-saving assistance", according to the UN, warning that 2.3 million more people there are "highly vulnerable". Hardest-hit areas are Ethiopia's eastern Afar and southern Somali regions, while water supplies are also unusually low in central and eastern Oromo region. Ethiopia's government has mobilised $33 million (30 million euros) in emergency aid, but the UN says it needs $237 million. "The support from donor agencies has not yet arrived in time to let us cope with the increasing number of the needy population," he said.